Any serious angler who goes to boat shows, reads fishing magazines or hangs around the docks has likely heard the ongoing buzz about CHIRP fishfinders. CHIRP, which stands for Compressed High Intensity Radar Pulse — has definitely taken the industry by storm, with a wide range of CHIRP-enabled systems currently offered by Furuno, Simrad, Lowrance, Garmin and Raymarine. Since CHIRP first hit the scene few years ago, manufacturers have expanded the technology and brought CHIRP capabilities across product lines to make it practical for more boats and fishermen. It’s hard to not be impressed when you view the highly detailed screen shots showing submerged trees, bridge pilings and ship wrecks in near photographic detail. Or bait schools where you see actual baitfish, instead of just dense “blobs” — and can even pick up individual gamefish queuing up to feed. Here at the GPS Store, we get lots of questions from customers about CHIRP, CHIRP Fishfinder and CHIRP Sonar — what it is, how it works, and whether it’s for them or not. 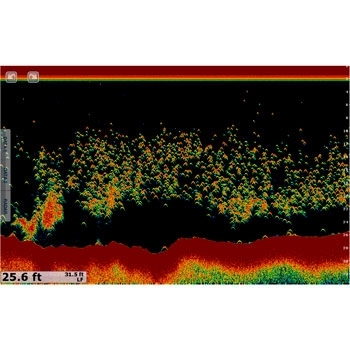 The first and most important item to understand is that CHIRP is a technology built into some of today's fishfinders/sonars. Most fishermen are familiar with fishfinders that work on single or dual frequencies, commonly 50kHz and/or 200kHz. Rather than emit pulses on set frequencies, CHIRP sounders emit multiple pulses that cross a wide range of frequencies from low to high (E.g. 42-65khz and 130-210khz). Advanced processing power in today’s machines separates the returns from all these pulses and deciphers this information to create a very detailed image of the bottom and suspended fish. Are there downsides to CHIRP technology? Well, for one, the most advanced “full CHIRP” Sounder modules combined with specialized CHIRP transducers can cost thousands of dollars. Obviously, people who are going to invest this much in fishfinding technology have to be pretty darned serious about their sport, and these powerful 1 to 3kW systems are the most appropriate for reaching depths up to 10,000 feet and detecting targets throughout the entire water column, particularly at higher vessel speeds. For those who can afford them, these full-fledged CHIRP systems can be excellent tools for bluewater angling. There has been much in the way of product development on the lower end of the spectrum, however, and variations of CHIRP fishfinders can now be had in systems carrying what was once considered “entry level” pricing. While these systems don’t provide all the performance, flexibility or capabilities of the high-end gear, they do offer freshwater and coastal fishermen some impressive technology and views of the world under their boats — especially when you consider that you can now get into the CHIRP game for a few hundred dollars. New, reasonably priced and sized CHIRP units abound, such as the Raymarine Dragonfly Series, the Garmin Stryker/echoMAP CHIRP series, or the Lowrance Hook Series. Although not meant as substitutes for systems you’d find on offshore battlewagons, they do give freshwater, coastal and inshore anglers a lot to see for the money — particularly when it comes to crisp, detailed images of rocks, trees, pilings and other bottom structure. Even in affordable units such as those from Garmin, CHIRP detail can be provided for below the boat as well as out the sides (DownVu/SideVu), helping anglers find new structure and fish they might otherwise have missed. Seeing all this (and in this much detail) would have seemed a pipe dream just a few years ago, much less at prices any boater can afford. It’s a brave new world in fishfinding technology, and today’s anglers are faced with more choices than ever before. For some, CHIRP is definitely the way to go if you’re in the market for a new sounder. There are scenarios, however, where traditional sounders will deliver better performance and satisfaction, based on what you’re trying to do. We’d love to help you find the best echosounder solutions for your boat, budget and style of fishing.